Source: Greenwich Graphic. September 23, 1899. Page 1 and 8. The Route Surveyed-Mr. Mead Offers Land for More than Half the Way-Road Starts at Voorhis' Quarry and Runs to Byram Road-Distance 2,307 feet-The matter Comes Up at Town Meeting. 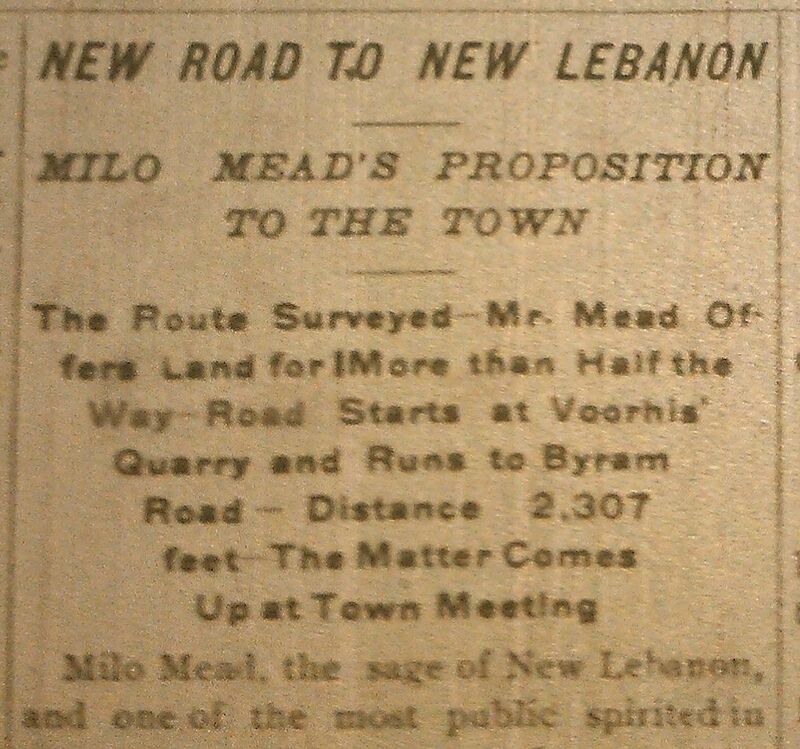 Milo Mead, the sage of New Lebanon, and one of the most public spirited in the town-would that we had many more such, will ask the town to construct a road from Greenwich to New Lebanon, he, to survey the road and give all the land on his property through which it passes. If Mr. Mead was a real estate agent or a schemer in the land business, it would be inferred that this was one of those jobs, sometimes rushed through at town meetings, whereby an individual gets a road made through his property, which benefits chiefly himself, and the town pays for it. Mr. Milo Mead is not that kind of a man. He takes great pride in New Lebanon, and anything that he considers will benefit property in that locality, if it is possible, the project is carried through. Mr. Mead is not a drone, neither does he travel in a stage coach, the trolley suits him, he lets others stick to the ideas of one hundred years ago. One has only to go to New Lebanon and Byram shore and see what he has done for that section of the town and the conclusion is forced upon him that Mr. Mead is no fossil. They say down there that he sleeps half of the night, and the other half lies awake thinking of what he can do to boom New Lebanon. About this new road, there is a map of it on the last page, which will give a pretty good idea of where it is located and the connections it makes with existing roads. It starts about in front of the farmhouse at Mr. John Voorhis' quarry. The route has been surveyed and the stakes indicate where the course of the road is. It runs through the land of Underhill Lyon a distance of ____ feet, through land of Thomas Ritch 433 feet, through land of Milo Mead 636 feet and Deborah Mead 433 feet.Mr. Mead will give the land through his property and Deborah Mead all do so also. Making a distance of 1091 feet which is about half the distance. Whether Mr. Lyon or Mr. Ritch will do likewise is not known, for they are non-committal on the subject. Mr. Milo Mead has no interest in this project other than a public spirited one. He says it will help his property some, but it will greatly benefit New Lebanon and Byram shore, for it will bring them in close touch with Greenwich, and shorten the distance, more than one half, than by the Post Road. It would make another of those Charming drives, away from the main road, for which Greenwich is famous. The total length of the road is 2,307 feet, not quite a half a mile. Mr. Mead estimates that it would cost about $2000 to build it, and this includes buying the land through the property of Underhill Lyon and Thomas Ritch if they should demand payment for it. The matter will come before the annual town meeting Monday, October 2, when the subject will be fully discussed, and it is hoped that Mr. Mead's proposal will be accepted. Source: Greenwich Graphic. December 30, 1899. Page 1. NEW LEBANON, CONN. Dec. 25, 1899. There was a statement in the Greenwich News, alias the "Greenwich History," about eight or ten weeks ago, that the cattle in different parts of this town and become drunk by the effect of eating so many apples. That was not the drunkenness of intoxication but of sickness. The apples acted as a cathartic and educed their strength which made them stagger. If a person should drink a quart of sweet cider at once it would make him sick, and he might stagger if he attempted to walk, though he would ______ or guise his family. Farmers say that the eating apples dries up the milk ____ milk cows. That need not be so if cows are fed a reasonable quantity of apples with hay, say half a bushel at a feeding, twice a day. The apples will increase the quantity of milk and have no injurious effect, except, perhaps, they may choke, the cows, but if they are fed in a manger in a stable, that will seldom happen. If the apples are poured on the ground the master cows will chase the others, and in their eagerness to get the apples they will crowd several into their mouths before they are chewed, and thereby be choked. 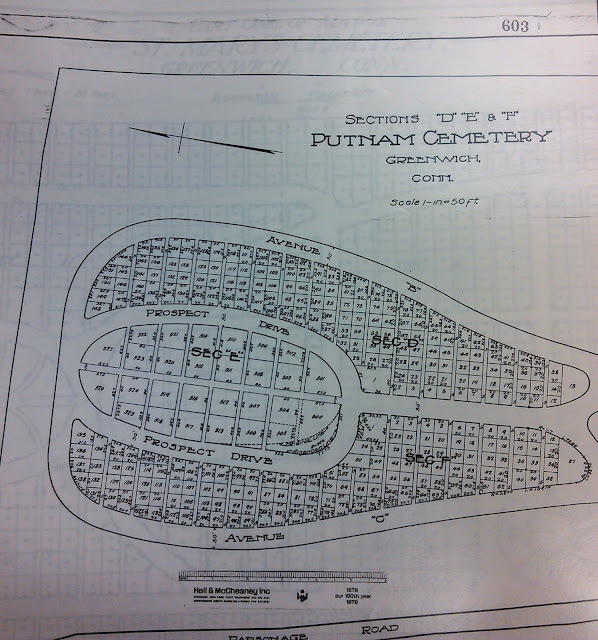 On a recent trip to Greenwich Town Hall we came upon these maps of Putnam Cemetery. 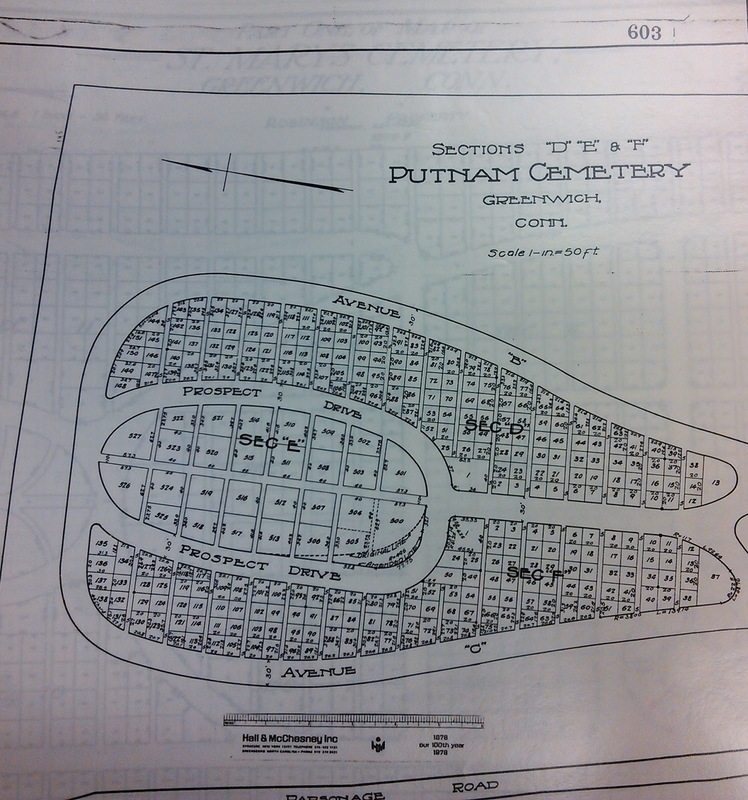 Located in the vault of the Town Clerk's Office, these maps show the laying out of grave plots when this cemetery was created and opened in the late 19th century. 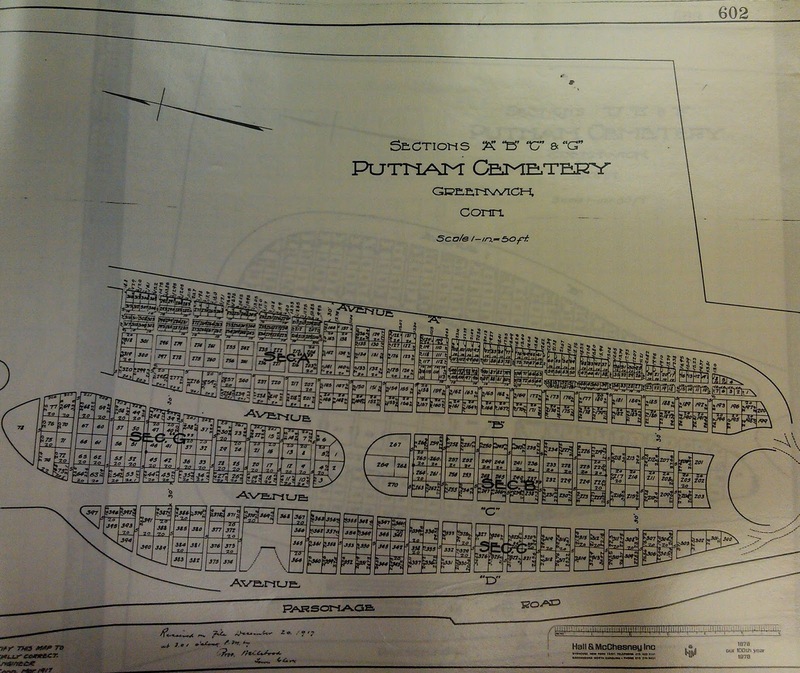 A number of small family plots in Greenwich were removed and relocated here. You can find these and other graves in the center section as one drives into the cemetery from the Parsonage Road entrance. 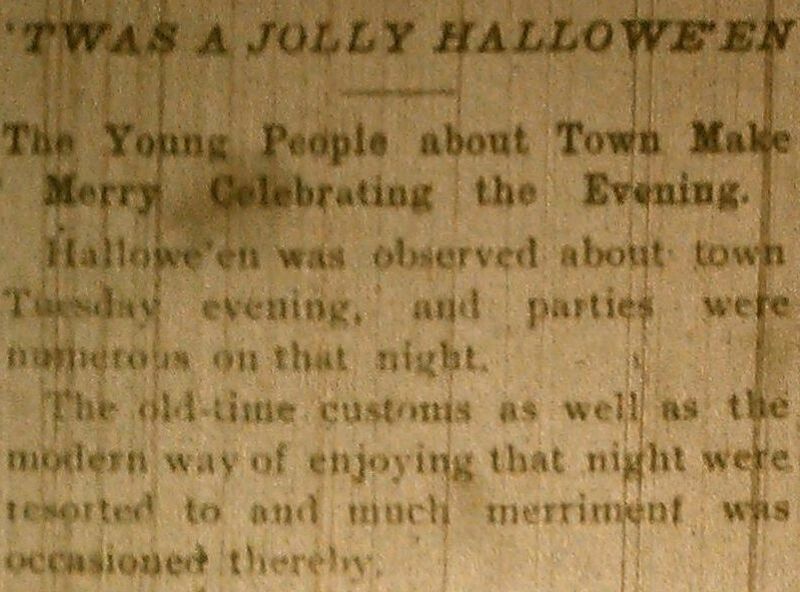 Hallowe'en was observed town Tuesday evening, and parties were numerous on that night. The old-time customs as well as the modern way of enjoying that night were resorted to and much merriment was occasioned thereby. It was a stormy night. This interfered somewhat with the plans of the merry gatherings, as many were kept at home who otherwise would have attended the parties. The rain also kept many of the small boys indoors. As a result, signs and gates were not conspicuously absent the following morning. A jolly time was passed at the home of Miss Clara Belcher Mead on that evening, when about twenty friends gathered to celebrate Hallowe'en. 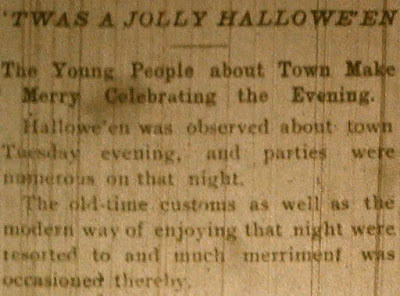 Here they enjoyed a masquerade in sheets and pillow cases, bobbing for apples, fortune telling and various other Hallowe'en methods of pleasures. Refreshments were served, and about midnight the merry gathering broke up and all left for their homes. Miss Mildred Ritch entertained about thirty of her friends at her home on Mason street Tuesday evening, the occasion being a barn dance. The house and barn were decorated with Chinese lanterns, and lanterns made from pumpkins, which appeared very appropriate for the occasion. About nine o'clock the dancing began, and was continued until past midnight. Mr. and Mrs. Thomas A. Mead entertained a number of friends Hallowe'en, at their home on Putnam Avenue, where a very enjoyable evening was spent. 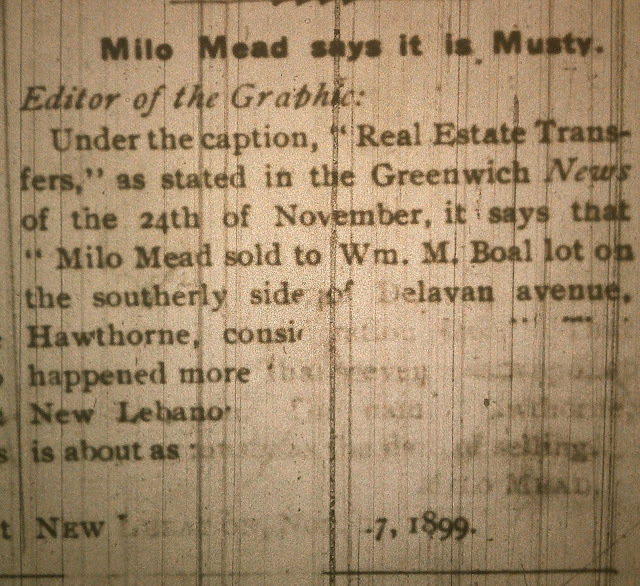 Source: Greenwich Graphic, November 1899. 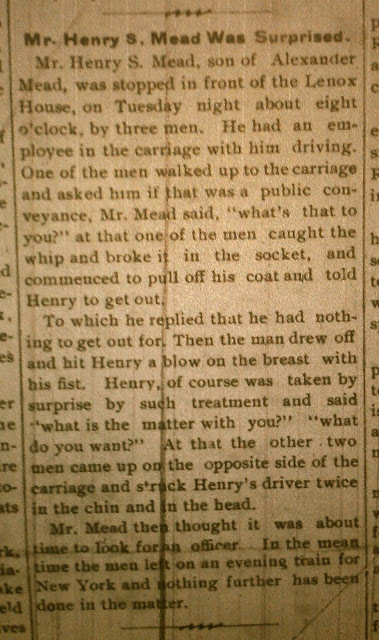 Mr. Henry S. Mead, son of Alexander Mead, was stopped in front of the Lenox house, on Tuesday night about eight o'clock, by three men. He had an employee in the carriage with him driving. One of the men walked up to the carriage asked him if that was a public conveyance, Mr. Mead said, "what's that to you?" at that one of the men caught the whip and broke it in the socket, and commenced to pull off his coat and told Henry to get out. To which he replied that he had nothing to get out for. Then the man drew off and hit Henry a blow on the breast with his fist. Henry, of course was taken by surprise by such treatment and said "what is the matter with you?" "what do you want? "At that the other two men came up on the opposite side of the carriage and struck Henry's driver twice in the chin and in the head. Mr. Mead then thought it was about time to look for an officer. In the meantime the men left on an evening train from New York and nothing further has been done in the matter. Source: Greenwich Graphic. October 21, 1899. The Marriage of Miss Sarah L. Mead and Mr. E. L. Holley. The Mead Homestead on Maple avenue presented a pretty scene on Tuesday evening, when Miss Sarah Lewis Mead, daughter of the late Solomon Mead, was married to Mr. Edward L. Holley, of Greenwich. Rev. Washington Choate performed the ceremony, assisted by Rev. B. M. Wright, of Orange, Conn.
Two little flower girls, Mildred Mead and Dorothea Barrows, escorted the bride. Messrs. Christy Mead and Everett Mead were the ushers. Pink and white chrysanthemums made the homestead bright with their beauty and color, and added an especial charm to the scene. There were about one hundred and seventy five relatives and friends of the bride and groom present at the marriage. The gifts to the bride were numerous and beautiful. After the ceremony, a wedding supper was served. 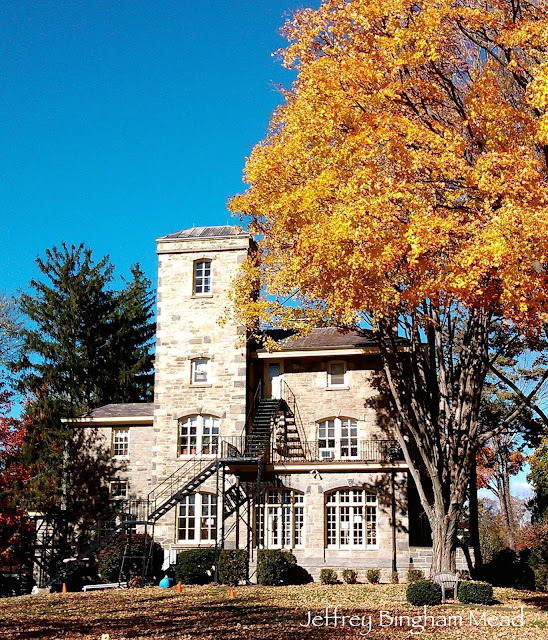 Upon their return from a wedding to her, Mr. and Mrs. Holley will reside in the Lyman cottage on Putnam avenue. Source: Greenwich Graphic: Saturday, June 17, 1899. New Lebanon, June 13. – In the last issue of the Greenwich News it is stated, among other things, under the caption of "Improvements at Hawthorne," that “he will also build a sidewalk.” There is, or was, a Milo in Ireland, and some persons have talked about naming their children Milo Mead, but they have not made their appearance yet. 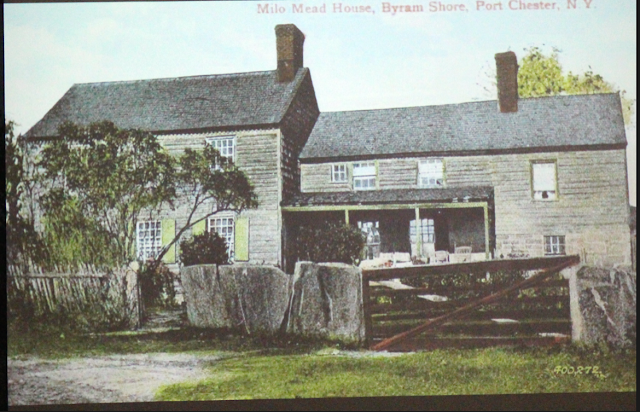 There is no other Milo Mead but the one who lives at the east side of the New Lebanon, near the Long Island Sound, and he has not agreed with the selectmen, or any individual, "to build a sidewalk." Source: Greenwich Graphic. December 16, 1899. Page 1. Mr. Milo Mead Tells about a Deed and Refutes Some Misstatements. DEAR SIR – The Greenwich News of the 8th of December says: "The western part of the town known to the United States Government as Hawthorne:" How is it that the Government knows it by that name? Probably by the influence of one dollar bills paid to some of the officers of the Government to have that name adopted. Probably not a baker's dozen of the inhabitants of this village were in favor of that name. The government knows very little of this a village only by reputation, certainly it is not by the general business that is done under that name. There is not a store or blacksmith’s shop, or shoe maker’s shop, or market, excepting one and that is unoccupied in the village that does business under the sign Hawthorne. The News says: "That the name excites his wrath (meaning myself) as much as a red rag does a bull.” If a bull could laugh and talk he might refer with a grin about the going for a red rag seven years after date, eastern time. “I am not in it” claims this singular paper. In the News of November 24th among the real estate transfers was this item. “Milo Mead to William Boal, lot on southerly side of Delavan Avenue,” this with the exception of the word Hawthorne the News says was copied from the warrantee (he made a mistake in spelling) it should have been warranty deed. The News says that I kept the deed, and that deed was drawn March 8th 1892 and recorded November 11th, 1899, and the paper says it does not know what my idea was in holding this deed back so long before having it recorded. Here the News evidently grins and thinks that it has scored a point against me. I did not hold the deed back, it was handed to the buyer of the ground within ten minutes after the money was paid. Perhaps it would be pertinent, to suggest to the editor of that Greenwich paper, the propriety of changing the name from the Greenwich News to the Greenwich History, news is what has lately happened, history is an account of what happened years ago. Near the beginning of the article he says I have an exclusive name for the for the place, and that I dislike both other names. That does not follow of course. A man may like three persons, but he may like one of them better than the other two. The sovereigns of Europe have names enough to nearly reach across this page. “The Fire Company there” (the article further says) “refused to apply that name (New Lebanon it means) to the organization even though a bribe was offered them in the shape of a building lot.” That is not exactly correct. Seventy-five dollars was offered to the company by three persons, which the “Greenwich History” would call a bribe. The company was organized and incorporated under the name of the “New Lebanon Fire Company,” but afterwards the name was changed to “Protection Fire Company.” The Editor of the “History” seems not to know in his writing and his talk the difference between a bribe and a prize. This is what the > Webster’s Dictionary says about a bribe, (part of the definition) “a price or reward with a view to pervert the judgment or corrupt the conduct of a judge, witness of other person or persons to some act contrary to what he knows to be the truth, justice or rectitude.” The editor of the “History” probably knows what the word bribe means, it is probably used by him for effect, not because there is an propriety in its use in respect to Belle Haven Avenue and the New Lebanon Fire Company.